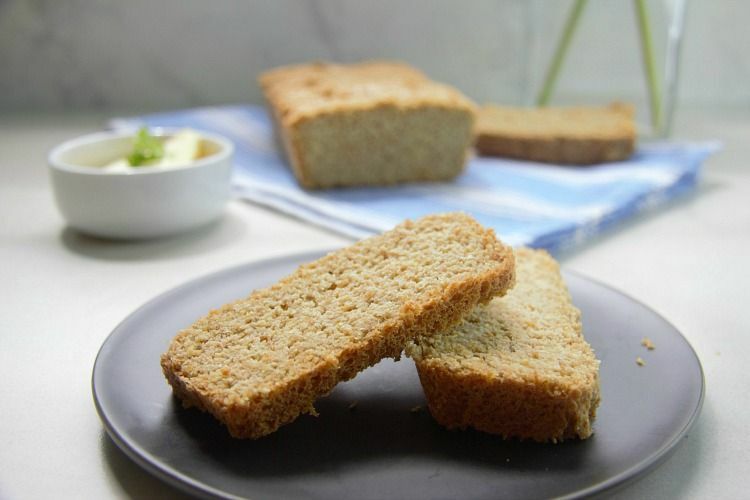 A flaxseed bread loaf that is a healthier replacement for bread as is is high in fibre and low in carbs. Gluten free too, this makes a great bread for toast. If you want a bread that is very low in carbs and gluten free, then this is the loaf for you since flaxseed is low in carbs and also has a high omega 3 fatty acid content (33 times higher than wheat germ). The fibre content is high too. The joy of flax! 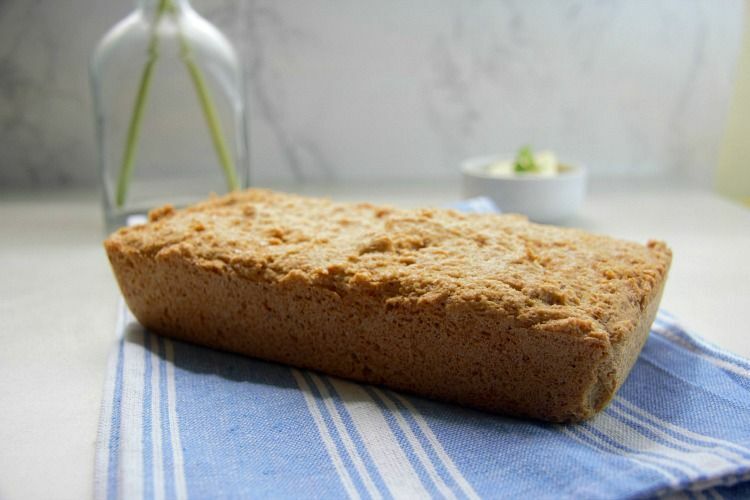 I adapted this recipe from http://www.blogilates.com/blog/2011/03/09/no-carb-bread/. This bread tastes like a wholewheat loaf and I love it toasted, slathered in butter. I usually toast this under the oven grill rather than in the toaster because it makes a moist loaf and is a challenge to get out of toaster! 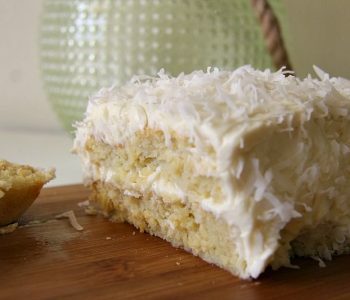 You can make this with just the egg whites and it works out fine. I’ve also made this with 5 egg yolks and have been happy with it. It’s up to you whether you want to add the egg yolks and it will depend upon the size of your eggs really. See how you go as you make the mixture and when you get to the stage that you could add egg yolks, see how thick the mixture is. If it’s too dry, add the egg yolks one by one until you are happy with it. Nothing worse than eggy bread! This is very low in carbs and is also gluten free. A great way to enjoy flaxseed in your diet. It keeps very well for at least a week in the fridge in a container. 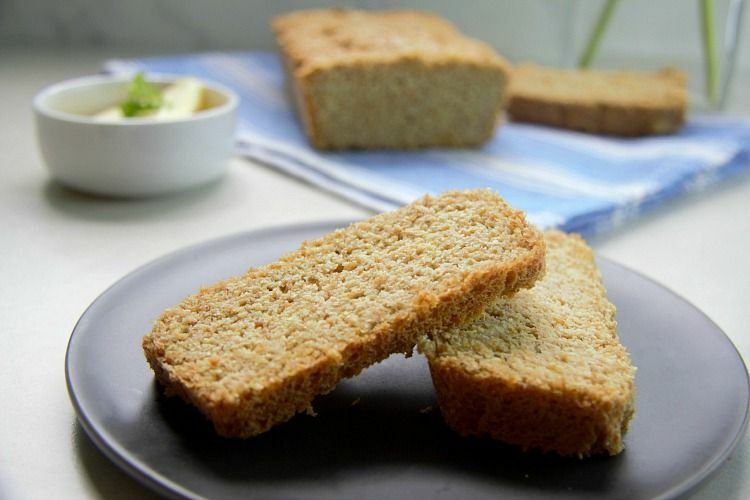 You could add herbs and spices to this flaxseed bread if you are not too keen on the taste. Or perhaps some nuts or dried fruit too? I’ve made a flaxseed bread flavoured with sundried tomato, olive and Feta cheese that you might also enjoy. 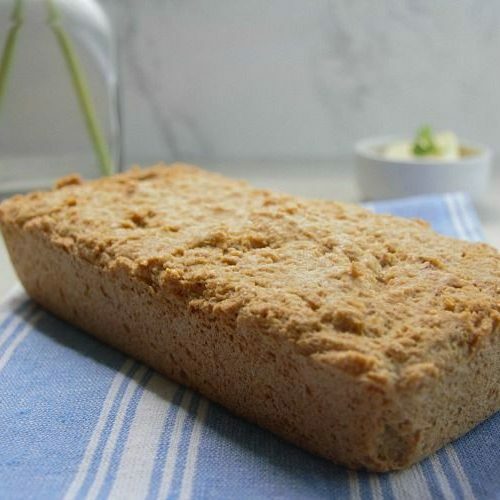 A great bread for weightloss or simply a healthier diet. In another bowl, blend the flax seed, baking powder, salt and oil. Add the egg yolks, water and apple cider vinegar. Gently fold the egg whites into the flaxseed mixture. Pour into a greased loaf pan and bake for 30 minutes until firm and golden. Thanks. Perhaps applesauce in place of the eggs? Hi tried your bread recipe and love it… my enitre family did… i just wanted to ask can i use the same method and make a finger millet bread?? 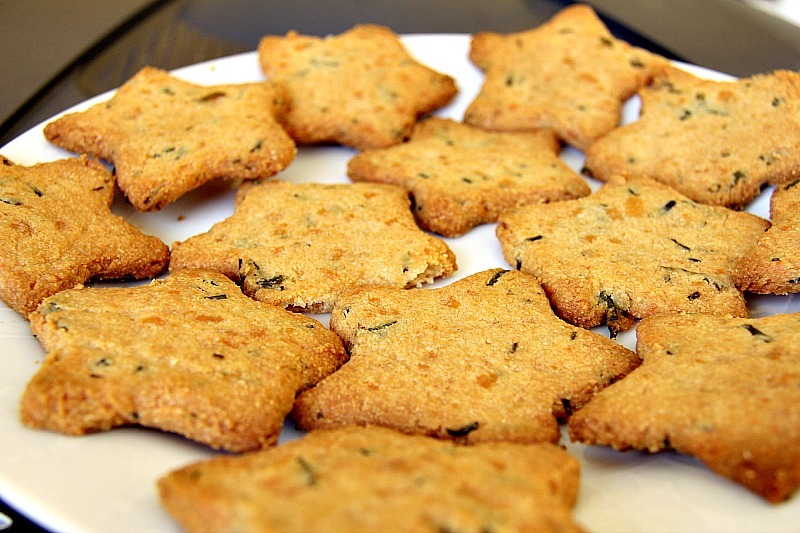 Can i use the same baking method for finger millet?? I can’t see why not! Happy baking! I use Sprouted flaxseed (milled/ground) from Linwoods – its much more nutritionally available and so healthier. You can find Linwoods Sprouted flaxseed on Amazon. Thanks for your time, great information! 2) Can I make that 1/2 cup of water boiling water? I made this recipe today with a few changes – subbed the water with almond milk because I use it in another flax bread recipe I make – added 3 Tbsp of Xyla (again from another recipe) – cut the salt to 1/2 tsp because the other recipe I make does not call for any – and finally, baked at 400 for the first 10 min as someone else suggested. But here is the kicker! After I had it in the oven for about 10 minutes I opened my microwave to heat my lunch and there sat the melted coconut oil that I forgot to add! I figured my bread was ruined, but it is not! In fact, it is not nearly as wet as the usual flax bread I make and that I noted a few commented on here about. Who knew! Love a good baking experiment! Thank you so much for this recipe. I love this bread. My roommate is type 2 Diabetic and she loves it enough to leave wheat bread alone now! I purchased a bag of golden flax meal from Costco today as I drink flax milk. We are hitting the road for 1.5 months and my milk may become hard to come by therefore, I am intending to make it on the road. 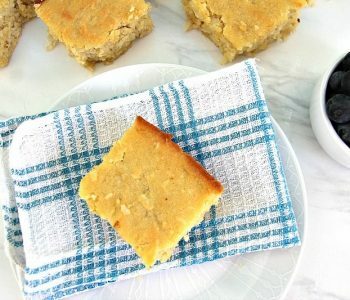 I cannot find a flax milk recipe with meal – they all are from the seed. Do you have a resource for this? Sorry, that’s not something I have in my list. Hi angela, my bread turned out kinda soggy in the middle. Any suggestions? I would bake it a bit longer by 10-15 minutes and perhaps reduce the eggs by one or two. Egg sizes vary and mine are a medium sized. Good luck next time! Great point, I have jumbo eggs and wasn’t sure what u were using. Can you update the recipe to indicate medium? Have you ever baked this in rolls instead of a loaf? I love having a fresh roll with meals rather than slices of bread. Thanks! I’m sure I missed this somewhere in the directions…what size is the loaf pan that you use? I can’t wait to taste thi bread! 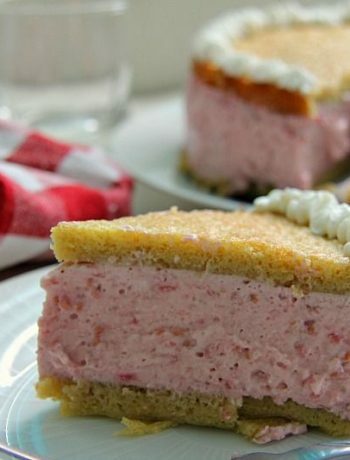 Hi Angela… First off, thanks a bunch for sharing this recipe! We just put it in the oven and we’re excited to try it… It’s already giving a great smell. One thing we were wondering about as I was plugging the recipe into MyFitnessPal… Is the baking powder supposed to be 1 tablespoon or 1 teaspoon? Your recipe calls for 1 tablespoon / 5g, but 1 tablespoon is about 14g, and 1 teaspoon is 4.8g. We used a tablespoon this time around, but just wanted to make sure that’s the correct amount in case we decide to try this again. I use a tablespoon but to be honest a teaspoon would do. I actually just sprinkle the powder direct from the container so it maybe between the two. This turned out perfectly! Thank you for sharing this! I used a glass loaf pan and baked at 400 for the first ten minutes as someone suggested. Glad you enjoyed the recipe Jennie! Just made this recipe and while it was baking it had a nice rise. But, after a while it deflated and I’m so disappointing. Apparently I’ve made this before because I have your recipe printed out and on it I’ve written “very good” 🙂 Anyway, does the deflating happen to you? I haven’t read all the comments to see if you’ve addressed this issue, sorry. Solid or me.ted coconut oil? I ask excited to try this recipe! I’ve been KETO for 9 months now. I’m allergic to nuts so I so happy to find your recipe! Also did you know that your bread will rise higher if you start out at 400°and after 10 min. turn it down to 350°? Holy craps, 340cal per serving! But, only 2g net carbs! This is an Atkins/Keto dieter’s dream! Hi! How about use the avocado oil but halve the apple cider vinegar? The vinegar helps the bread rise so you may want to keep it. Tasted sour, salty, and just plain awful. What did I do wrong? My first though is how fresh is the flaxseed you used? It can go rancid. Yes as the vinegar combines with the baking powder to give it a bit of a lift. At least it tasted good as that’s the main thing! is it 340 Calories per slice or 12? 340 per slice – Yes, heavy on the cals in my opinion (but it’s coming from the flax seed). If you want less than a carb per slice, here’s your answer! 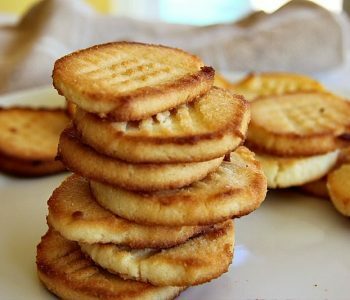 Could you (in time) add metric weights to this recipe? And confirming your tablespoons are 15 ml. Morning! Will do this later today (once I’ve walked the dogs). Let me know if there are any other recipes too as I try to do both measurements for recent recipes and have a backlog of old recipes to update! Too salty! Is there really supposed to be a full teaspoon? That’s normally okay for me. Try a half next time? Thank you and have a good New Year! Hi Elea! That sounds a lovely idea! Happy new year to you too! I gave this a try tonight with a slight variation. I used 5 eggs and instead of seperating the yokes from the whites, I whisked them together with an electric mixer that has a whisk attachment. Then I baked it in a cast iron bread pan that I coated with butter before pouring the mixture in. It came out real good. Glad it worked out and you enjoyed it! Just made the loaf–came out well. I added maple extract. One thing that was not clear with the directions–it calls for 5 eggs; but only the whites are used? Or do the yolks get added in when it says add eggs! I made it without the yolks–but would like to know for sure. Hi, it should include the yolks but I’ve found that 2 or 3 are needed. I’ll amend the recipe. Glad it came out well for you! 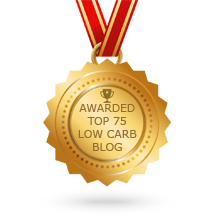 Hi, sorry , was supposed to read low carb, and not card| Mes excuses! Thanks. Hi Angela, WOW! WOW! This bread has come to have me leave for good any other kind of bread! Finally! I am so happy about that, and enjoy the bread as much as other breads I use to eat! I make mine with a bit of crushed hot chile peppers, and I toast it also for breakfast, when I have bread with my first meal! 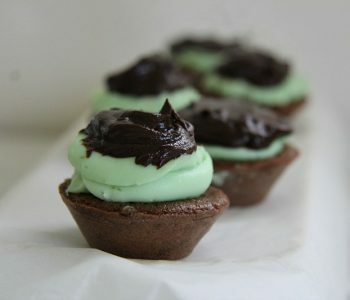 I also have made some desserts and every body enjoyed! Thanks to you Angela and your great ideas, I can stay on this low card path which has had me loose almost 30 pounds within the last year! Sooooo happy you exist! Thanks a million times from Québec, Canada! Way to go! You’re super! Keep up the good work! 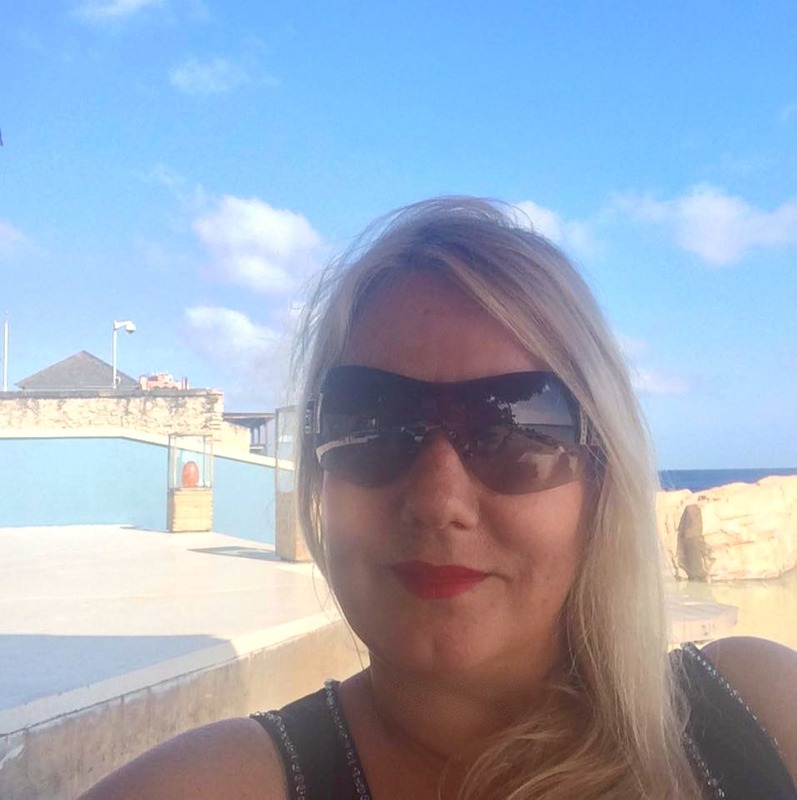 You’ve made my day with your lovely comments! Thanks and well done you on your progress! Great comments from you Mieg! I’m just starting to use your recipes – been successful with some, but the flax bread doesn’t reach my expectations. I’ll try different ones and hope for great results. Thank you Angela for sharing your ideas. It makes great garlic bread for a quick lunch or make French toast with it. Ooh! Love the tips! thanks! This would benefit by baking with a parchment-lined pan. I had a terrible time getting the loaf to release. I love the taste of this bread! Glad you enjoyed the taste and thanks for the tip! This is excellent bread! First time in 2 years I got my BLT! It does take something like an hour to toast 😉 but it is truly tasty. I have a couple of quick questions. Like some others mine caved in the middle. My b.soda is fresh and my ‘thought’ was that it actually started rising in the pan as I ended the ‘folding’ in of egg whites so I swiped it across the top and flattened it? Could that have had an impact? I always take folding as well gently swirling in, not mixing until it is fully combined, but where you could see an egg white swirl it was actually white and it was somehow airy? Also, would psyllium husk help this bread? I read where it really is key to gluten free bread. But you’re the expert. The bread is moist and there is condensation in the container in the fridge… I’m concerned it will go bad and wondered how you store it. Despite all… it is delicious and at 1 carb who is going to ever complain! I also had one slice for breakfast and am still full way past lunch. Thanks for all your hard work. I’ve made other things from your site and love them. Hi Ros! Glad you are enjoying the recipes and thanks for popping by! Think the swiping of the top probably deflated it but the trick is not to overwork this mixture too much too. I love the idea of psyllium husk to the recipe too…definitely think it would help and is something I will try! Perhaps 1 to 2 tablespoons. I store my bread in the fridge and wrap a piece of kitchen towel around it. Happy baking! I store mine in the freezer. Cut it into slices first then you can take out how many you want to toast. 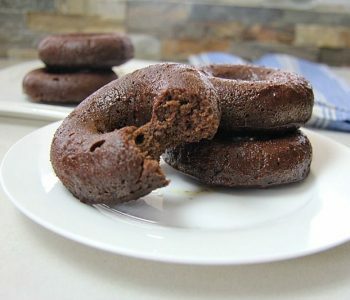 Hi Angela, thanks for the recipe it tastes really nice my only problem is that it didn’t rise much and the middle part was a bit too moist like it didn’t cook very well, also it stuck really well to the pan, very hard to unmold, I don’t know what I did wrong everyone else here have had better outcomes, any suggestions? I’ve been playing around with it and added more cinnamon and coconut milk but that’s probably just a personal taste. Enjoy! LOL! I am currently in love with flaxseed pancakes…ate a whole batch the other night and lay on the sofa moaning afterwards (so very filling!). Can’t wait to try it. I’m not clear on the eggs – do the egg yolks not get used in this recipe? Or are the yolks added in step 4 with the water and vinegar? Thanks! Hi, yes the yolks get added into step 4 with the water and vinegar. Happy Baking! 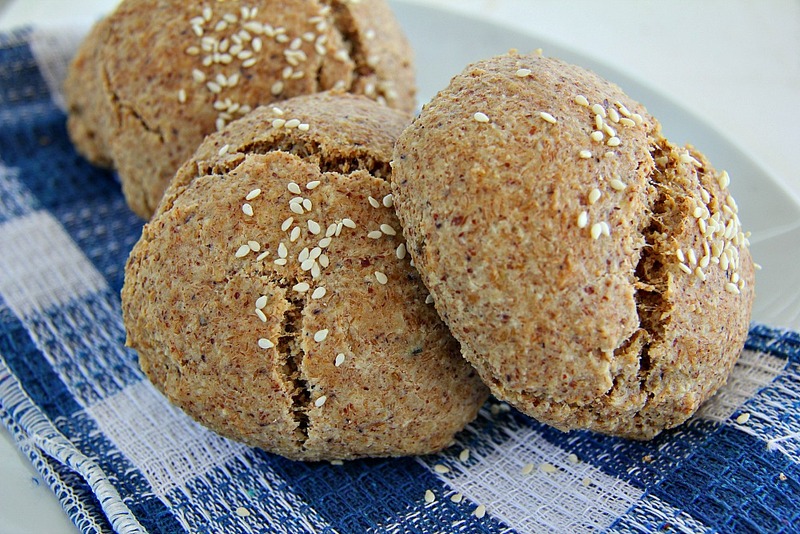 An easy and low carb bread recipe using ground flaxseed. How finely ground does the flax need to be? That rough grind like how pre-ground flax comes? Or a finer more powdery grind? Hi Ali, it can be as finely ground as you want. I purchase the ready ground flaxseed. Happy baking! I just use the grind I find at the bulk food store. I am on WW and I won’t make any recipe without knowing the nutritional values. This bread sounds great. I need to know the protein, fat content, amt. of carbs and amt. of fibre per slice. Has anyone worked that out? I’ve updated the recipe with the nutritional content. Happy Baking! Thank you SO much. I’ll be making this tomorrow. It sounds so good. I just discovered your site and it is great. I can’t wait to try more of your recipes. I really need to cut down on carbs. I am a carb addict. So I gave up on bread and miss it so much. So tomorrow I’m buying both coconut and almond flour, etc. I’ll let you know how I do with the recipes. Thanks again for your immediate response. Awwwh, just glad you found me and always love feedback! Please let me know how the baking goes. Thanks!! Do we use only the egg whites for this recipe? No, you use all of the eggs. The whites are whisked separately though. Happy Baking! Hmmmm… Was it ground flaxseed? It sure was… golden ground flaxseed. Perhaps some more water might help? Anyone else had this problem please shout out! Alas the same issue occurred. I added more water but the mixture was really dense when adding the beaten egg white. Do you “blend” by hand or in a mixer? That’s a shame! I mix mine by hand. So your mixture should be light and airy – making it easy to add the egg whites? I’ll try again with coconut oil this time. This time it worked! I was able to happily “pour” the mixture into the silicon bread pan. Beautiful and light. I changed brands of flax. Thanks ! Huzzah! Glad it worked out! Hmmm… Perhaps one less egg? Sounds like the mixture is too moist. Have you changed the recipe in any way? What size loaf pan are you using? How long have you left it in the oven? When all else fails, you can cut slices and then toast the bread. That is what I generally do. I’ve baked it up to double the time usually given. Be sure to use a toothpick (or spaghetti stick) to poke into the loaf to find out if it is cooked. What size loaf pan do you use for this bread? This looks wonderful. New to your site and have subscribed. Thanks. Welcome Dita! I use a 1lb loaf tin (17 x 7.5 x 6 cm). Hope you enjoy the recipes and happy baking! Some have mentioned how best to store. I find it easy to make two loaves whilst I am messing up so I freeze it. Easiest thing to do is slice it and then cut some parchment paper tabs and insert between the slices. That way the slices will separate without un-thawing the whole loaf. Hi Necia for the larger loaf what size tin did you use? In addition how much did you increase the other ingredients by? Hi Barbara, My loaf pan is approx 9″ x 5.5″. I think I worked it out about right. By dividing the weight of the two cups by 5, I got 43 grams (you might get something a bit different) and times by 6. Then I just added an extra egg (6), extra coconut oil (6) and then took a guess at the remaining items. I think Ruby is right in that mixing the wet ingredients really well helps. I made sure my oven was hot – I actually had to turn it up to 400 to get a 350 reading which amazed me – and then worked quickly adding the wet to the dry – you can feel the baking powder start working and I wanted to get the egg white in as quickly as possible. A big balloon whisk was great for this and the mixture came close to filling the pan but it cooked very nicely and rose without spilling over. Baked for between 45 / 50 minutes. Hope this helps. Second time around, this bread recipe came out wonderful. The first time around I was being careful not to break up the egg white too much, the second time I used a large whisk to mix the egg white in thoroughly, but quickly before the baking soda lost it’s purpose. I also tested the oven temperature and found my oven way off so increased the temperature. I’m sure this was a big factor too. I wanted a larger (thicker) loaf, so weighed the two cups of flaxseed, divided by 5, (I got 43 grams) and increased the other ingredients accordingly. Trying hard to keep my husband gluten free (as he has lost so much weight) and he absolutely loves this bread, toasted or not. It is a real winner. Thank you. Now I need a bread I can use to make gluten free stuffing for Thanksgiving… any ideas?? Hi Necia, glad you enjoy this! For stuffing, I would recommend my favourite bread recipes..look under Amazing bread rolls on the recipe list. Best Gluten Free alternative to bread yet! Thanks for popping by! Happy Baking! Thanks for the recommendation. I tried this today and it is a perfect consistency for stuffing – but equally it is a delicious bread (so says hubby again)…. I made it as a single loaf, but I can see it making very nice rolls. This is definitely another winner for me. Do you think it would work if I doubled the quantities to make a larger loaf? Definitely! I double up and bake in a loaf tin but add about another 20 mins to the cooking time. Enjoy!! I whisk all the wet ingredients really well before adding them to the dry. Love this bread and so have some of my gluten-free friends. Hi cooked mine and it came out very pale and the top just spilled over and looked very unappetising . Can’t understand what happened and fed it to the ducks!!!!! 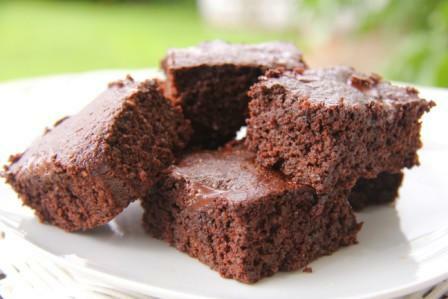 Can I use brown flax seed flour? Hi, of course! The colour will just be darker. Hope you enjoy it! Thanks for the replies, will try and let you know, happy baking! I have made a flax seed bread before and the consistency was sort of slimy, what could the cause be…… flax seed? Perhaps the mixture was too wet? Reduce the number of eggs. Hope it works out! Bake it for longer – I sometimes leave it in for 30 – 45 minutes. Test it with a cake tester or I use a piece of spaghetti – if it comes ouf moist then let it stay a bit longer. Another option is make toast of slices of your loaf. Scoop into a greased muffin tins and bake for 15 minutes until firm and golden. Fantastic Ruby! Thanks for sharing this! Looks delicious! Sounds good Ruby! What does the apple sauce do for the recipe, as I see quite a few recipes including sugar free apple sauce? You can use the unsweetened applesauce or mashed bananas to replace any oil in the recipe. Hi Ruby.. can you make a loaf out of this instead of muffins? Hi have just baked the loaf and wondered how to store and for how long! Love your recipes and still experimenting as new to the Wheat Free way of life. Hi Barbara! I keep mine in the fridge for about 5 days (if it makes that long!). If you find it gets a bit moist, towards the end, toast the bread. So glad you are enjoying the recipes! Thanks for popping by! Thanks and you are right do not think loaf will last the five days! Now my Brother want one so do I just double the amounts to make two at once? 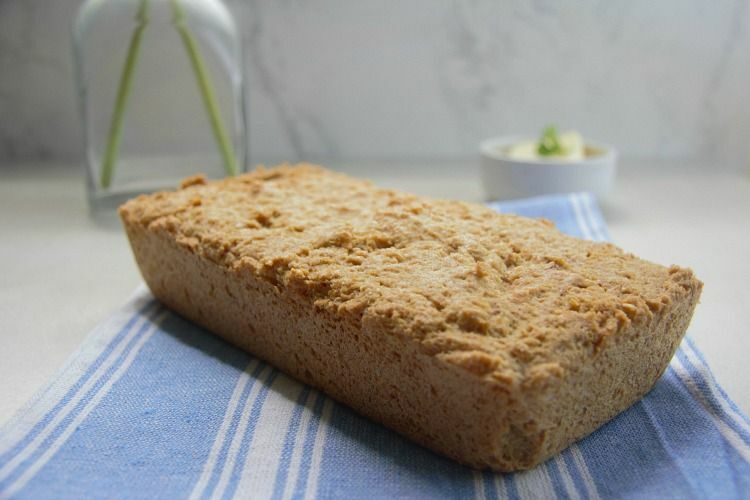 Best recipe for wheat free bread so far!!! Thanks Barbara! So glad you enjoy it and the site! Thanks for popping by! After it has cooled, I just slice it and store it in the fridge. It is delicious toasted as well. The total net carb for the whole loaf would be about 12-14 net carbs. Anything I can use to replace the apple cider vinegar? Perhaps a white wine vinegar as it is mild in taste. I don’t use apple cider vinegar at all and it comes out perfect. I think I’ll try it with the vinegar next time. Fantastic! Glad it worked out. The apple cider helps act as a raising agent, but if it worked out fine without it that’s great! So glad you enjoyed it and thanks for stopping by! Good idea with the lemon juice! Oh my! I’ve got to make this! We miss home made bread so much. The only time I make it is to make my honey challah for Christmas and/or Thanksgiving. And your description is mouth watering. The only thing I wonder about is the flaxseed taste. I’ve tried the oil for salad dressing due to the omega 3 in it but we both didn’t like the taste. Too strong. Where do you get your flaxseed? Glad you like the sound of it! I use ground golden flaxseed that is sold in my local healthshop. I’ve made this and the bread has a slightly nutty taste. It is really a great replacement for regular bread. It is delicious toasted as well.